First of all I requested an airport shuttle for the next morning with specific times and the taxi showed up but not for 4 people and 8 suitcases. The taxi driver was kind enough to make everyone and luggage fit. Mama and Nicos were very friendly and hospitable . The bar -b - que was excellent. The food was good and excellent value for money. We would recommend Kleanthi Apartments. Kleanthi and her son Nikos could not have done any more for us. They made us feel so welcome and they were absolutely fantastic hosts. Bed, mattresses and pillows are excellent. Rooms are just renovated and the aesthetics are great. A subtle relaxing style in the interior and the pool next to the olive garden helped us unwind from the city stress. Owners are discrete and helpful. For the price we a paid (35 euros for four beds for a night at early May) value is absolutely great. Friendly welcome. Helpful advice on shopping and eating out. Was nice of the staff to give us a room last night ute but the room was very average. Owner was wery frendly. I had 2 loggias and picturesque wiev.Location was good, all cities reach by bus. Surroundings very nice. Love the location, set back off the road backing onto a lovely peaceful Olive Grove, so peaceful sitting in the evening or early morning listening to the Cicadas chirping. So we'll looked after again by Nikos and Kleanthi, they do a great cooked Breakfast by the way! 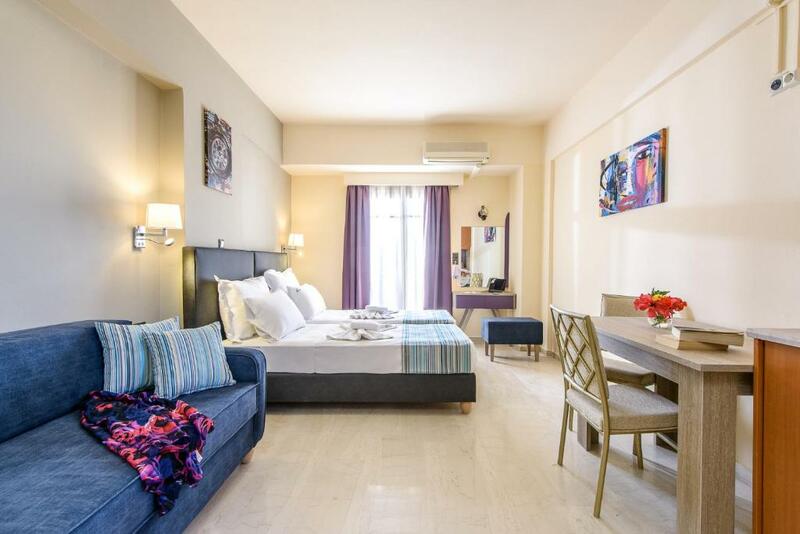 Lock in a great price for Kleanthi Apartments – rated 8.7 by recent guests! One of our best sellers in Gouves! 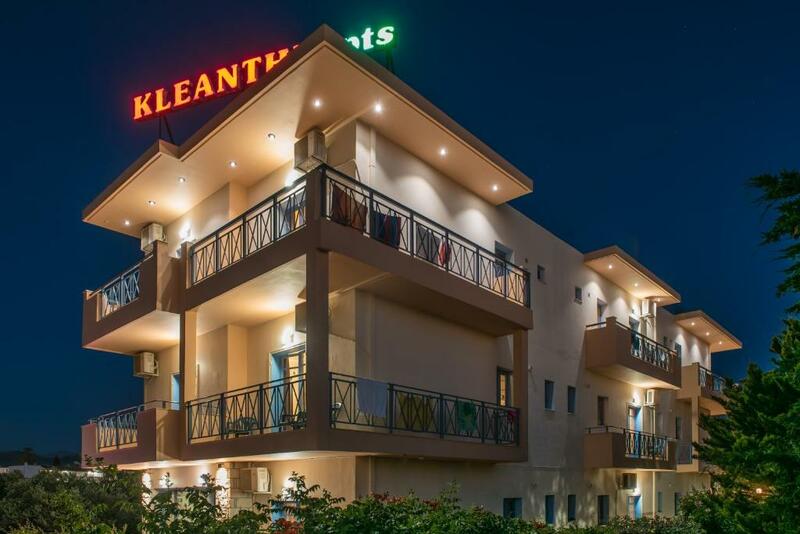 Featuring an outdoor swimming pool and snack bar, Kleanthi Apartments offers apartments with a balcony. 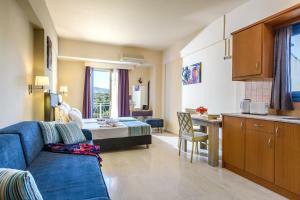 It is located 1,650 feet from the nearest beach in Kato Gouves in Crete. Free Wi-Fi is offered in public areas. 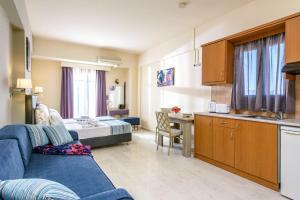 All apartments feature a kitchenette with dining area, fridge and electric kettle. The bathroom comes with a shower. Kleanthi Apartments is 11 mi from the city of Heraklion with its Archaeological Museum and the archaeological site of Knossos. Guests can visit the lively town of Limenas Chersonisou, 5.6 mi away. Heraklion International Airport is 9.3 mi away. 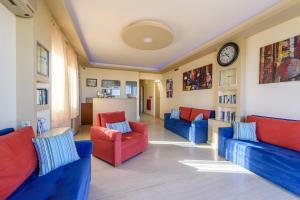 This property is also rated for the best value in Gouves! Guests are getting more for their money when compared to other properties in this city. 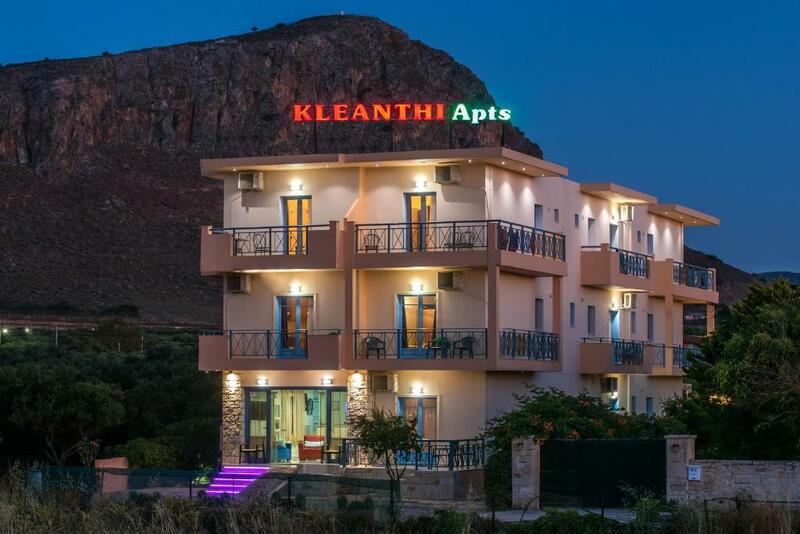 When would you like to stay at Kleanthi Apartments? Featuring a balcony, the studio includes a kitchenette with dining area, fridge and electric kettle. The bathroom comes with a shower. Please note that air conditioning and safety deposit box come with an extra charge. Featuring a balcony, the apartment features a kitchenette with dining area, fridge and electric kettle. The bathroom comes with a shower. 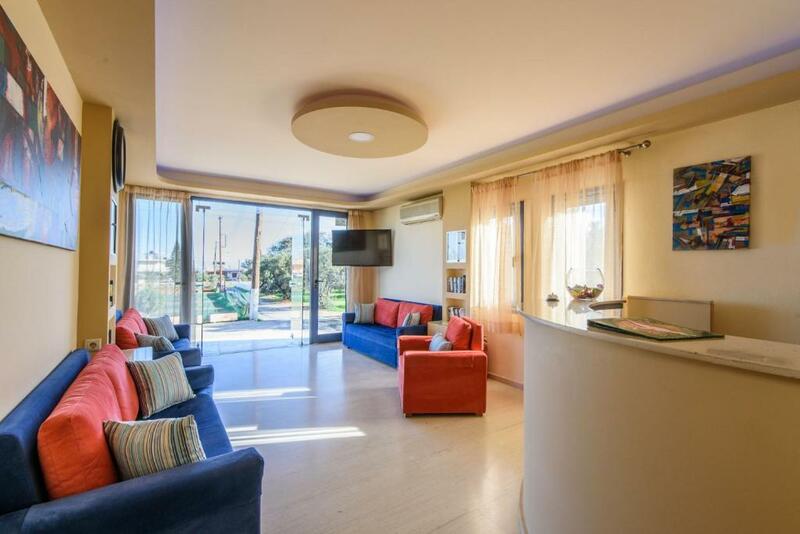 The Kleanthi Apts are situated on the outskirts of Gouves in a quiet location ,offering self catering accomodation with friendly and wellcoming atmosphere. The main selling point seems to be its location,just 10 minutes walk from the shopping center of Gouves and 5 minutes from the beach. The apts is a favorite with returning guests so its defenatelly doing something right. 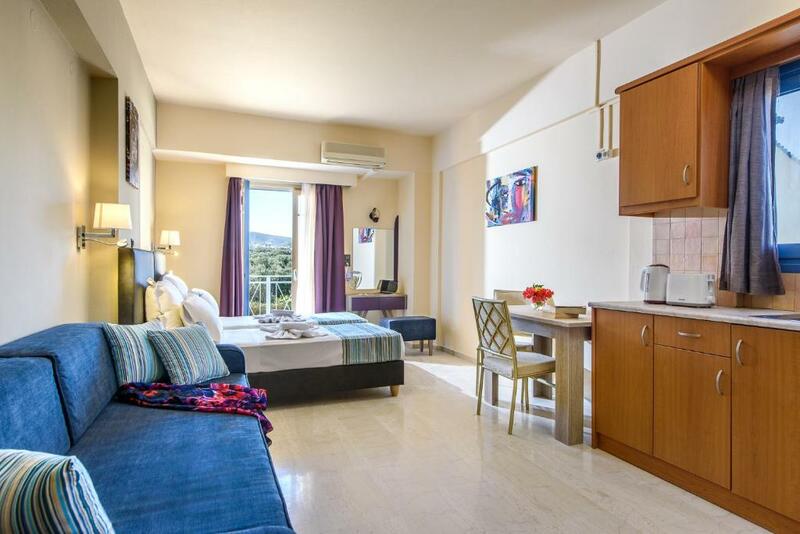 The apartments themselves are what you expect from the bughet Greek Hotel simpel and comfy. 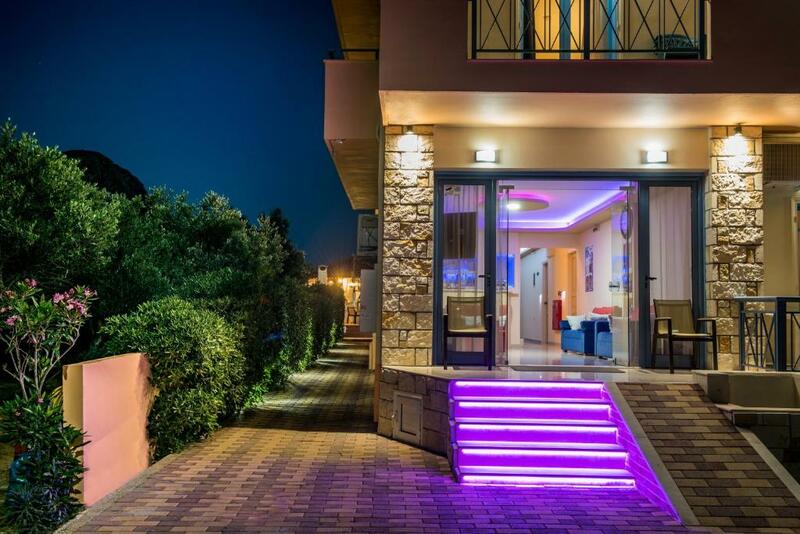 House Rules Kleanthi Apartments takes special requests – add in the next step! Kleanthi Apartments accepts these cards and reserves the right to temporarily hold an amount prior to arrival. There was nothing we did not like . The noise from incoming aircraft and the nearby road was fairly high but the apartment was well insulated. Pool, room, view from balcony, price. Minor glitches, nothing worth to mention. The front desk personnel was at first not very approachable or friendly but did assist us by letting us store our luggage in a downstairs room since this facility had no elevator which was very bad. There was mould in the fridge and the fridge (that wasn't turned on) smelt bad, beds uncomfortable. Room size was good and it was cheap but wouldn't use again. Beds small and uncomfortable. Lack of hot water in the moring is a bit of a pain, maybe we were up too late though! Lack of hot water in the mornings was a little bit of an inconvenience. We were so well looked after by Nikos and Kleanthi who made us feel so at home just made for a greal holiday.Will definitely be back again in the future.